The wonderfully unique and unusual bars in London are integral to the fantastic nightlife. 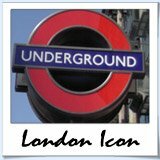 When you're looking for places to drink in London you'll be spoilt for choice - actually, thats half the challenge, so many bars, so little time. These bars are NOT run of the mill and you won't find them on every corner. 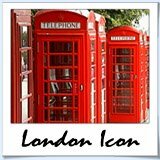 In fact Sherlock Holmes would have trouble finding some of these hidden lesser known gems. Grab your detective hat and dancing shoes, lets go! Walk into Waxy O'Connors and you'll be transported to a labyrinth of 4 unusual bars across 6 levels deep in the forest of Ireland. Recognised for it's reputation for traditional service, honest home cooking and an extensive range of beers, spirits and coffees Waxy's has something for everyone. 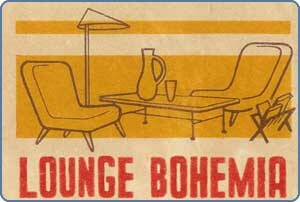 Lounge Bohemia is one of the locals favourite unusual bars in London. After standing hesitantly at the street level unmarked door, you'll be escorted down the spiral staircase into an 1960's Eastern European cocktail wonderland complete with low tables, comfy sofas and funky light fittings. The mood is intimate and relaxed as a jazz soundtrack plays in the background and you peruse the creative 'gastro-molecular' cocktail menu. Your first taste confirms your choice, cocktails of the finest order. Don't miss this one! With drink names like 'Whats Your Poison' London's Purl bar is not your average cocktail establishment. Decked out like a 1920's speak easy the bar is seperated in to small intimate rooms where you can sink into a couch while amazing 'different' concoctions are ferried to you by your friendly server. 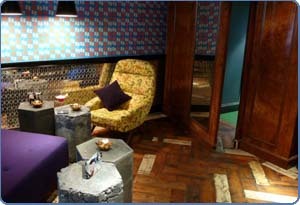 Bookings adviced for this unusual bar in London. With in the Courthouse Hotel is 'The Bar'. It's one of the best unusual bars in London featuring original holding cells as 'VIP' rooms - they're cosy and intimate, I promise. The 3 cells can be booked in advance and can cater for groups of up to 8 people. 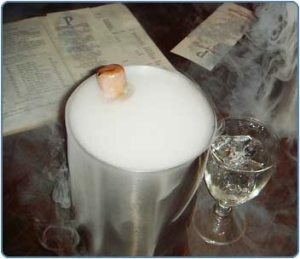 On the drinks menu you will find a range of beers, wines and spirits as well as a number of legal themed cocktails. Delicious bar food is available so no matter what sentence you get, you'll be catered for. Back in the 18th century when The Castle was visited by a penniless King George (apparently by mistake) they needed to find a way to keep the him happy, but not give away beer for free. The ever resourceful king issued the pub with a pawnbroking license and started cashing in his wares. 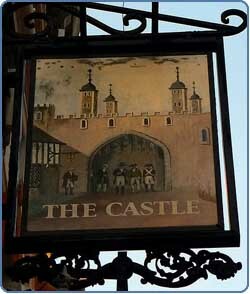 The king got his beer and pub kept the license that is still in operation today. Great beer, great service and yummy food. 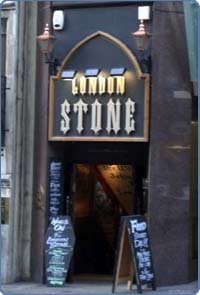 The London Stone is a pub by the Eerie Pub Company and has a gothic theme. The pub is decked out with everything goth. ghouls and goblins watch over you while you drink, while the walls are covered in spooky pictures, masks and other artefacts. Fancy a drink or food special? Checkout the coffin blackboards in this, one of the most spookily unusual bars in London. Keep your eyes peeled, this bar can be hard to find. Imagine 1930's Berlin meets New York all in a basement bar that only just big enough to swing a cat around in. 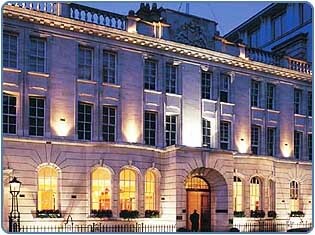 Each night there is a bill of talented cabaret, lounge singers and drag acts providing entertainment while you sip the night away. Of the unusual bars in London, this one has a little secret, it was a public toilet in a previously life. Get there before 8:00pm for drinks specials and to bag the best seat in the house. 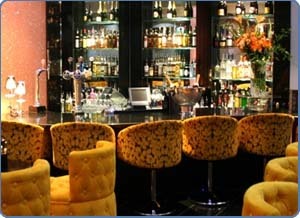 Annies Bar is a beautifully designed, chic and friendly. There is a rich and luxurious feel throughout with chandeliers beautiful, vintage sofas and a baby grand piano. Seen as one of the more unusual bars in London Annies offer low calorie cocktails and high calorie pies and mash. There is a condradiction in the clientele also, from esteemed business people to grunge rockers all enjoying this fantastic bar. Callohh Callay is a fun, uber cool and unusual bar in London. Featuring well thoughtout cocktails the bar loosely themed around Alice in Wonderland. Sipping cocktails in this establishment will take you to all sorts of wonderlands. The design is eccentric, fascinating and full of delightful conversation peices including a secret door disguised as cupboards. 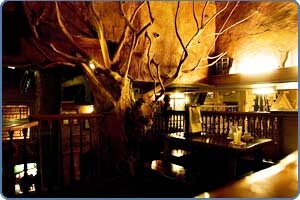 This bar recieves accolade after accolade for fantastic service and drinks - put it high on your list.